Ratu Kadavulevu School Under 18 team during the Sanix World Rugby Youth Tournament in Japan. 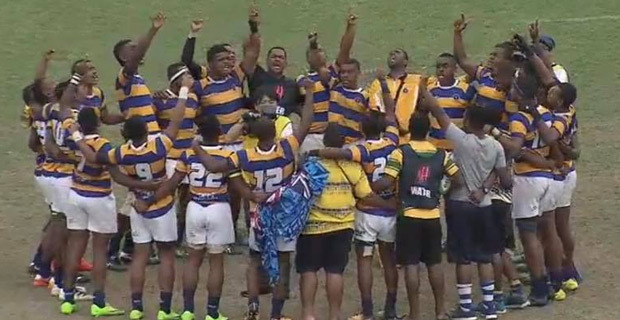 It will be a historic day for Ratu Kadavulevu School as they prepare to celebrate their sporting achievements this Saturday. They will be acknowledging their athletes after their win in the Boys Division at the Coca‑Cola Games this year after 21 years and the win from the Sanix World Youth Tournament in Japan. Vice Principal, Walesi Soqoiwasa has confirmed that the grand celebrations will be held at the School in Tailevu. He says the celebration will start with a march from Korovou town to Ratu Kadavulevu School at 8am with stops at Sawakasa village and Lodoni village. Soqoiwasa says other details to the celebrations such as their prizes will be finalized later today. RKS are also defending the Coke Zero Deans Rugby and Rugby League in all the grades.